“My integrity and reputation is on the line. I have worked hard to build it up over the last 45 years. I will do my job. 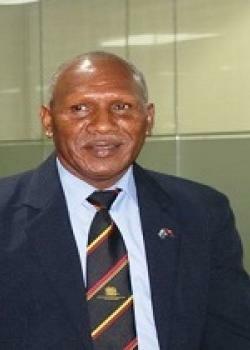 I urge all the critics to stop being judgmental and give me the benefit of a doubt,” says Papua New Guinea Police Commissioner Gari Baki. Commissioner Baki was responding to the warrant of arrest for Prime Minister Peter O’Neil currently being the hot gossip subject of PNG citizens. “I have stated that I welcome the decision of the courts. However, as you would have gathered, the Court has issued a further stay on the warrant, thus preventing any police action. That is my position and I will not change it. I want everyone to appreciate where I am coming from with regards to this particular issue,” Baki said. He said regardless of the allegations and the Warrant of Arrest, Peter O’Neill is still an elected national leader and Prime Minister of Papua New Guinea. Respect must be accorded to him regardless. “Critics are calling on the police to arrest him on the streets like a common criminal. “The presumption of innocence unless proven guilty in a court of law and his status as Prime Minister dictates that we treat him with a certain level of decency. “Hence I will not arrest him in the streets but invite him to the police station where he will be interviewed, Baki said. He said as for police and as the commissioner the case should not have dragged if Director Fraud and Anti-Corruption Chief Superintendent Mathew Damaru and his team fully detailed him on the matter. “I will only invite O’Neil when I have detailed information and having access to the file itself. I want assurance that I have legs to stand on when we bring the Prime Minister in for the interview because at the end of the day I will be held responsible,” Baki said.